The World Health Organization has warned that billions of people across the world are drinking contaminated water as a result of poor sanitation and a lack of investment. Together with the UN, the World Health Organization (WHO) has issued a new report “UN-Water Global Analysis and Assessment of Sanitation and Drinking-Water (GLAAS) 2017.” While significant strides have been made in some areas of the world to secure and improve water supplies, the report found that many of the world’s poorest are still at risk from unsafe water because world governments are not investing enough money in infrastructure development in order to meet what are known as the ambitions Sustainable Development Goals. Today, almost two billion people use a source of drinking-water contaminated with feces, putting them at risk of contracting cholera, dysentery, typhoid and polio. 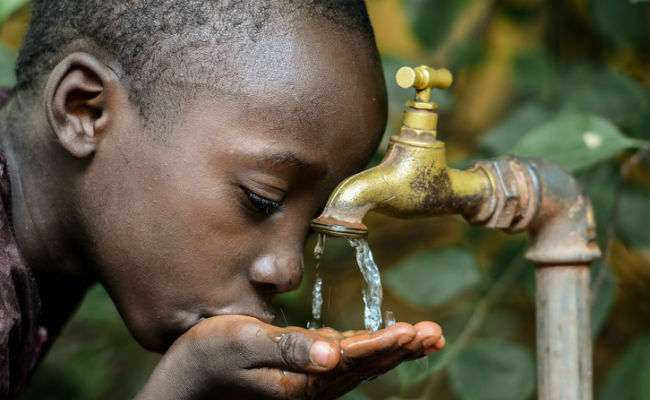 Contaminated drinking-water is estimated to cause more than 500 000 diarrhoeal deaths each year and is a major factor in several neglected tropical diseases, including intestinal worms, schistosomiasis, and trachoma. The Sustainable Development Goals are a complex set of criteria that differs from nation to nation, but they all have one common goal: that by the year 2030 everyone in the world will have access to safe water. There are some positive signs for safe water development. The report isn’t all negative, and it’s important to recognize that advancements in this area have been made. For example, the report praises countries for increasing their annual spending on sanitation over the past three years. In fact, global average spending on this goal has increased by nearly five percent. In addition, water and sanitation spending has increased, going from US$ 6.3 to US$ 7.4 billion in the period 2012 to 2015. That’s a significant increase. Unfortunately, not everything in the report is positive. Greater aid is needed if the world is to meet its ambitious water safety goals. While spending has increased, actual commitments to global aid for sanitation have decreased from US$ 10.4 billion to US$ 8.2 billion as of 2015. This looks like a pattern that, at the moment, seems likely to continue. The knock on effect is that the disbursements provided underprivileged countries will also decrease over time as commitments are made to cover multiple years and we are seeing a clear move to tighten those purse strings. That’s worrying. What’s more, it’s likely to impact the most vulnerable in our societies. While 70 percent of countries under the United Nations/WHO evaluation have specific policies (dubbed WASH plans) that are designed to help them meet poor populations’ needs for better water sanitation, the report notes that only a minority are actually following through on those plans. Such plans will be critical for meeting the ultimate goal of having safe water for everyone by 2030, but following through on these plans also has wider importance. A lack of food security and poor sanitation are also often linked, and this shows how poverty can perpetuate itself. A report from UNICEF issued in late March finds that 27 million people around the world are at risk of famine while also not having access to safe drinking water. Famine-threatened regions like Nigeria, Somalia, South Sudan and Yemen are at particular risk, and as UNICEF notes this kind of situation can set up a cycle of poverty from which people cannot escape. Poor health means that people will not be able to work. A lack of people in employment plus the need for government assistance (where it is available) drains the economy of its forward momentum. This creates less resources that can be put into food production and safe water. A lack of sanitation then creates more people who are unwell, and so the cycle continues. International crises like those unfolding in Syria and neighboring states are also likely to disrupt food supplies (as we have already seen) and damage infrastructure, which means the risk of unsafe water increases dramatically. One central issue is that many of the world’s poorest nations are struggling to even establish basic infrastructure in rural and poverty stricken areas. That means that their spending can’t focus on the specific problem of safe water because they are still trying to establish things like reliable power and road access. Money needs to be targeted at both these areas if we’re going to make a change. So what will it take to fix this problem? According to the World Bank data provided by WHO, an investment of some US $114 billion per year solely targeted at sanitation and securing water supplies would be needed. This figure does not include the various costs that are associated with running and maintaining safe water ways. In total, its estimated that the current world spending on sanitation (including aid) would have to triple to meet the true needs of the world’s poorest–and that’s a point worth remembering. This isn’t asking for special favors or access to a luxury product. Access to safe drinking water is one of the most fundamental and basic requirements we all need. Surely, every person deserves that? Aria Spenser, like I'm going to let that happen!! Trump can't do diddly squat so easily. I will see to it that MY drinking water stays drinkable. If I see even a little amount of contaminants in my drinking water, I'm suing. WATER, LIKE LIFE, IS NOT A MERCHANDISE. Only COLLECTIVE ownership of water supply and a PUBLIC management of supply and sanitation services will ensure global access to this basic resource and essential services. It will also guarantee a full management which results into a socially equal management, ecologically sustainable, politically democratic and culturally acceptable. As always, the ultimate solution is not just more clean water. It is fewer people by way of more human birth control. And at the rate that we are going, unchecked human-caused global warming will take care of our unchecked overpopulation sooner rather than later.